I like humour! I like humour and nice things! Does ivarstar belong in this group? Are you married to a clown? Are you married to a clown? 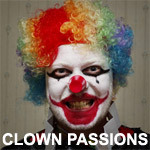 I am casting a project and hoping to talk to people married to or in an LTR with a clown or circus performer. Does realcast belong in this group? Does ultimatevampire belong in this group? Does shoja belong in this group?